How do the following religious systems view the deity of Christ? “To say that Jesus was ‘just’ a good moral man or a good teacher is out of the question.” Why? “The present authors believe God has revealed Himself in various ways, but each of them can be objectively tested by His two supreme revelations, the Bible and the person of Jesus.” How? What do 2 Timothy 3:16-17, Jude 3, Galatians 1:8, Revelation 22.19 and Deuteronomy 4:2 state about the Bible’s claims to be the final authority for determining matters of doctrine? What do Job 11:7, 42:2-6, Psalm 145:3, Isaiah 40:13, 55:8, 9 and Romans 8:33 state about the incomprehensibility of God? What do Hebrews 1: 1-3, John 14:8 and Colossians 1:15 say about God’s revelation of Himself in the person of Jesus? What are the issues if Christ was God in the form of a man? What do Isaiah 42:8, 48:8, Isaiah 45:5, 21-22, Jeremiah 10:6, 1 Corinthians 8:4-6, Deuteronomy 6:13-14 and Matthew 4:10 say about idolatry? What do the Scriptures teach about God? What does Robert Passantino say about the general and moral attributes of God? What do we mean (and do not mean) when we say that God is triune? How can we summarize biblical doctrine of the Trinity? “Jesus Christ is both a name and a title.” Explain. How do Philippians 2:5-11 describe Jesus’ dual nature as both God and man? What is the strongest argument for the deity of Christ? What effect did it have on the Jewish authorities? What name of God most revered by the Jews did Jesus claim for Himself? In what parts of the Bible did Jesus used the term “ego eimi” of Himself as it can be used only of God? Why did the Jews try to stone Jesus in John 8:57-59? How did Mark in his Gospel interpret Isaiah 40:3? How did Paul in Romans 10:13 interpret Joel 2:32? How did Peter use Joel 2:32 in Acts chapter 2 to claim deity for Christ? 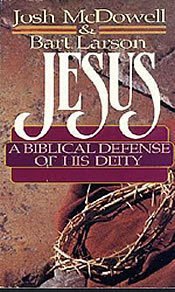 How do John 10.30-33 prove that even Christ’s enemies recognized He was claiming deity? What is meant by the “Granville Sharpe construction”? What does Dr. Ernest Cadman Colwell of the University of Chicago say about why the indefinite article '”a”' cannot be used before '”God” in John 1:1? What does F. F. Bruce, an expert in biblical languages, say about the construction of John 1:1? How can Jesus be “God” and “with God” at the same time? How does The Way International interpret Jesus’ being the “Word”? What are the problems with their interpretation? The “first 18 verses of John is repeated about Jesus elsewhere in the Gospel or in other New Testament passages”. What are these passages? “Jesus and God are both called the Alpha and Omega, the first and the last, in Scripture.” What are these Scriptures? How is “Kurios” used in the Old and the New Testaments? What is one reason the early Christians and Jews were persecuted? What are several clear examples in the Scriptures where Jesus is called “Lord” in the sacred sense? What are the five New Testament examples where prayer is offered to Jesus in heaven as Lord (or the Son of God)? “Paul used the same language and imagery in calling Jesus Lord that Isaiah used in the Old Testament of Yahweh (Jehovah).” Explain. The Jews who heard Jesus’ statements about the Sabbath considered His words blasphemy. Why? “The God of the Old Testament stated unequivocally that He alone is the Savior….Yet Scripture explicitly states that Jesus is also savior.” What are these Scriptures? How did Paul in Titus 2:10, 13, 3:4, 6 claim that Jesus is God? How do I Timothy 6:14-16 argue for Christ’s divinity? How do the following titles prove the claims for Christ’s divinity? “Just as God is omnipresent in a personal sense (Psalm 139:7; Proverbs 15:3), and thus is able to help, deliver, love, defend and meet His people's deepest longings and needs, so the New Testament describes Christ also as omnipresent.” Explain. How do Matthew 18:20, 28:20, Romans 8:9, Galatians 2:20, Ephesians 3:17, Colossians 1:27, Revelation 3:20 and 2 Corinthians 13:5 prove that Christ is omnipresent? What do we mean when we say that God is omniscient? How do John 2:24-25, 6:64, 16:30 and 21:17 prove that Christ is omniscient? What do Dr. John Walvoord and Thomas Schultz say about the omniscience of Christ? What do the Hebrew words “El Shaddai” mean? What does Dr. John Walvoord say about the evidence for the omnipotence of Christ? “Many passages in Scripture support Jesus' existing prior to His birth, not as a mere idea in the foreknowledge of God, but in actuality.” What are these verses? What do Exodus 3.14, Habakkuk 3:6 and Deuteronomy 33:26-27 say about the eternalness of God? What proofs are there that Christ is also eternal? What is “immutability”? What do Malachi 3:6, James 1:17, Psalm 33:11 and Isaiah 46:9-10 say about the immutability of God? If Jesus went through “human developmental changes”, how can He be immutable? What one word does the New Testament use primarily for worship? What Scriptures show that Christ received worship by men? By angels? What do John 2:19 and 10:18 say about Christ’s power and authority to resurrect Himself? “Not only did Jesus claim the names, titles, and attributes of God, receive worship, and claim the authority to resurrect Himself, but He also spoke things that only God could rightfully speak.” What were these things? What did C.S. Lewis say about the choices people can have in viewing who Christ is? What does Colossians 2:9 say about Christ being God and man? What is assumed by the statement that Jesus gave up His equality with God? The Greek word for “equality” comes from what root word? What does the Philippians passage teach about Jesus existing in two forms? What does the word “grasped” imply? “Jesus’ submission does not deny His essential equality with the Father and the Holy Spirit.” Explain using John 5:17, 18 and the illustration bybiblical commentator Leon Morris. To the Jews, what was the implication Jesus called God His own Father? Scriptures like Exodus 33:20; John 1: 18; 1 Timothy 6:16; l John 4:12, etc. state that “no one has seen God”. How was God “seen” in Exodus 33:23, Genesis 32:28 compared with Hosea 12:3-4, Genesis 32:30, Exodus 24:9, 2 Judges 13:22 and Isaiah 6:1-3, 5? “The New Testament teaches that God has been seen in time and history in the person of Jesus Christ.” Explain. What does the Greek term for “exact reproduction” mean according to Thayer? What do the Greek words “teknon” and “huios” mean? The word “Son” was used of Jesus in what four ways? How was the term “Son of Man” used in the Old Testament? What about in the New Testament? “Christ used the title ‘Son of Man’ to reveal a divine figure.” Explain. “Christ used the title ‘Son of Man’ to reveal a human figure.” What were the three ways this title was used of Christ? What is the significance of Christ identifying Himself as the “Son of man” referred to in Daniel 7:13-14? According to Gleason Archer, why would the Messiah of necessity have two natures, human and divine? “That Jesus Christ is the Son of God, the second person of the Holy Trinity, is essential to the doctrine of the incarnation.” Explain. According to Boettner, what ideas do the terms “Father” and “Son” carry? According to Griffith Thomas, why is the term “Son of God” a title to deity? What did the following church fathers say about the deity of Christ? Could these documents by these church fathers have been forged? Could Scriptures have been tampered with? Why did Arius’ denial of the deity of Christ become a major theological issue within the church? How did Arianism influence the church? What did Mark Noll write about the Nicene Creed? Christ was very God of very God. Christ was of one substance with the Father. Christ was begotten, not made. Christ became man for us men and for our salvation. What was the Council of Chalcedon? How do you answer the following questions or objections to the deity of Christ? 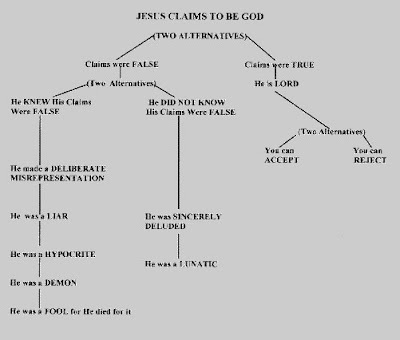 “Many people through the centuries have experienced a similar struggle when confronted with Jesus’ question, ‘Who do you say that I am?’ We are faced with a trilemma.” Explain what this trilemma is all about using the diagram below. For further explanation of the trilemma diagram, please read the books “Evidence That Demands A Verdict” (chapter 7) and “More Than a Carpenter” (chapter 2) by Josh McDowell.